Nudges and choice architecture are complex and advanced topics. During my master’s program, I had an entire course on choice architecture, so I’m going to break down this foundational topic into a series. 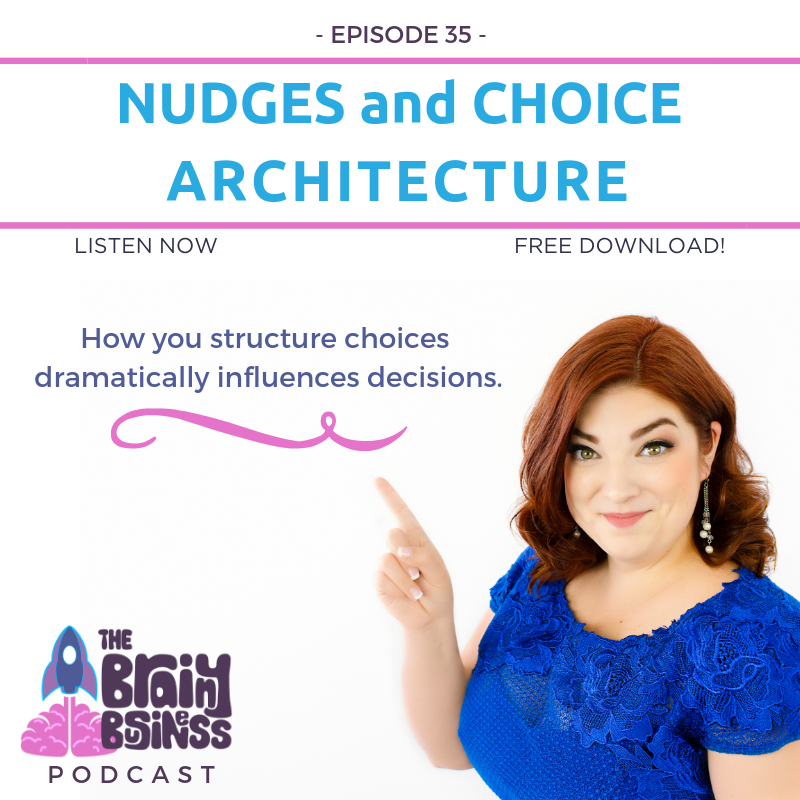 Today’s behavioral economics podcast is an introduction to nudges and choice architecture. In each episode, I’ll share the concept and then give real life examples to illustrate that concept. You’re a choice architect whether you realize it or not, and honestly whether you want to be or not. So, it is best to understand the concepts. Don’t you owe it to the people you are presenting choices to? Wouldn’t you want someone in your same position to help you to make the best possible choice? This series is going to help you so much in your life and business both when you are making choices and when you are constructing them for others. [03:29] In its most core definition, a nudge is a gentle touch or tap. [04:37] An example of nudges in a school cafeteria where rearranging the food items impacted their consumption by 25%. A prominent position can increase consumption by 25% and a less prominent position can decrease consumption by 25%. [06:55] An excerpt from Nudge which outlines the dilemma of where how to structure the food in the cafeteria: 1. Arrange the food to make the students best off, all things considered. 2. Choose the food order at random. 3. Try to arrange the food to get the kids to pick the same foods they would choose on their own. 4. Maximize the sales of the items from the suppliers that are willing to offer the largest bribes. 5. Maximize profits, period. [07:50] Option 1 has obvious appeal, yet it does seem a bit intrusive. [08:25] Option 2, arranging the food at random, could be considered fair-minded and principled. [08:55] Option 3 might seem to be an honorable attempt to avoid intrusion (but the test shows why this is flawed). [09:44] Option 4 might appeal to a corrupt person in the job (not us). [10:02] Option 5 has some appeal, especially if we think the best cafeteria is the one that makes the most money. [10:22] What would you choose? How would you choose? This, is the burden of the choice architect. Many of you are already choice architects and you might not even realize it. [11:15] There are many parallels between choice architecture and more traditional forms of architecture. A crucial parallel is that there is no such thing as a “neutral” design. [13:16] A choice architect must choose a particular arrangement of the food options for lunch (or whatever choice they are facilitating) and by doing so we can influence what people eat. We can nudge. [14:15] Some of the key takeaways from the paraphrased explanation are: 1. Everything matters 2. There are no neutral options 3. You cannot avoid being a choice architect – any format is influencing the choices, so it is best to be informed 4. Nudges can help simplify complex choices and help illogical humans make good choices 5. Nudges are not mandates – they need to be easily avoidable to still count as a nudge. [15:02] Choice architecture and nudges are very closely tied – but they are not the same thing. [15:12] A choice architect is someone who indirectly influences the choices of other people. The choice architecture is the mechanism you use to facilitate the choices. [15:26] A nudge is something you would use to influence the decision. [16:21] An example of the concepts using an HR department: You want to structure choices on a form to help encourage employees to contribute to their retirement account. [18:21] The first item on the list will have the most weight on the brain. It’s best to put the recommendation first (a nudge). [19:49] This example includes framing, priming, and anchoring and adjustment. [23:39] For your options, you can include several positive options (which start with the word “yes”) and then one “no” option at the bottom. These nudgy options remind the user of the expert recommendations. You can also prime them to contribute at a later time. [24:21] Options on online sign-up forms. [26:56] When used subtly, nudges are very effective. [29:25] Choice architecture is used in all sorts of decisions – from retirement plans to choosing a flight for your next trip. [29:49] Proper choice architecture and nudges can increase profitability on menus, help people to save more for retirement, decrease infection rates and deaths at hospitals, increase organ donations, get more money for public parks, help people to use less energy, and more. [30:20] In this series, I will be outlining choice architecture and the different types of nudges. I will introduce the topic and then give you practical examples. [31:24] There are six categories of NUDGES: iNcentives, Understand mappings, Defaults, Give feedback, Expect error, and Structure complex choices. [33:46] Can nudges be used outside of choice architecture or can you have choice architecture without a nudge? Not really…for example, even if you don’t put effort into creating a nudge, there is always a default. So, it is best to be informed and think strategically.